Many people are leaving their houses and apartments in favor of life on the road, building homes inside of vehicles like vans, buses, campers, minivans, and RVs. You're likely to see all kinds of mobile dwellings parked outside the information center, around Swanny Park, and at the library. Who are these crazy people? What would motivate a person to live in such a tiny space, often forgoing a shower, refrigerator, and toilet? There are as many reasons to live in a van as there are vandwellers, but I'll point out some common themes and explain why I choose to live in my vehicle. Some people feel miserable being stuck in one location, preferring to travel continually. Some do it because it's trendy and they have the money to spend on a fancy or classic rig. Other people have lost their home to a financial crisis and a van is better than sleeping on the street, though it's still not what they'd prefer. Others are pursuing a passion that requires a lot of moving around. Some do it because it's cheap. One thing we all have in common is that for some reason or another we feel it's the best available option for our lives. Personally, I'm drawn to the combination of frugality and mobility. I'm content with minimal possessions and enjoy sleeping outdoors. Since I'm working toward making a living as a writer, having free time to travel and reflect is more valuable to me than constantly earning money to pay hundreds of dollars for a living situation I don't want or need. Also, since I move around the West seasonally, a home on wheels is a foundation no matter where I go. In recent years vandwelling has grown from a "down by the river" joke into a glamorous millenial dream. #Vanlife is an instagram sensation: images of $50,000 Sprinter vans decked out with the slickest gear, beautiful young white heterosexual digital-nomad couples lounging half-nakedly in front of stunning ocean sunsets. "Wow, now that's living! ", exclaim the adoring masses. It seems romantic, but most vandwellers pee into jugs, shower infrequently, and experience their fair share of frustration and anxiety. Instagram stars usually spend more time curating their image than enjoying nature. There is magic on the road, and it's worth trying if you're interested, but anyone expecting a picture perfect experience might be disappointed by the reality. The number of vandwellers in the real-life and digital gathering places I participate in is 20 times greater now than it was three years ago. It has become a movement which cannot be stopped. 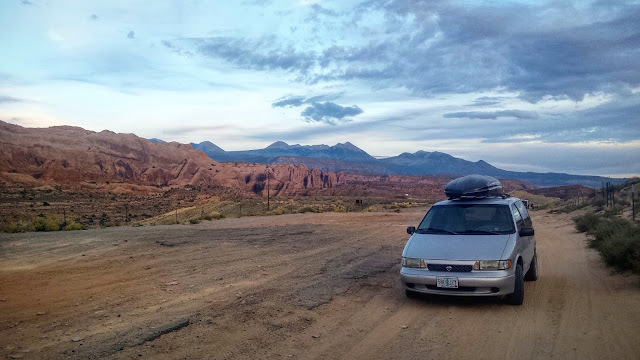 Moab has long attracted the sort of adventurous folks who embrace the dirtbag lifestyle, so vandwelling is nothing new here, but there's another local factor increasing its prevalence: affordable long-term rentals in town are scarce, and at the same time the booming tourist crowd demands more low-wage workers. Where else are they supposed to live? It's illegal to camp in a van on city streets or residential property. The only reason I've heard for this prohibition is sanitation, but considering that so many new hotel rooms are being added in spite of an already over-capacity wastewater treatment plant, I find it hard to believe that sanitation is of high concern; and we're not that disgusting in the first place. Officially allowing vehicle/RV camping could alleviate some of the competition for affordable rentals. RV parks are available but not ideal for most vandwellers. Symbiotic relationships could be formed with homeowners, exchanging the stability of a legitimate parking spot for extra driveway security or rent money. The reality is that people are doing it anyway, and they're needlessly burdened with a constant fear of eviction. If the current housing trend continues, people will have to commute daily from the closest towns, increasing traffic and pollution. No offense to those other towns, but most people choose to work in Moab because they want to live in Moab. Should that be a privilege only afforded to homeowners? Vandwelling certainly isn't the solution to this problem, as most people getting squeezed out of their homes don't want to live in a van and shouldn't have to. But it's a possible partial solution that shouldn't be ignored. I'm writing this column from Portland, OR, where I'm building a shuttle bus into a home that will comfortably meet my needs and leave me with more energy to pour into my writing. I miss Moab greatly and I'm planning to return as soon as possible to keep building my connections with the community. I believe I have something valuable to offer, yet there's a nagging worry every time I think about returning: "how am I going to find a secure place to park this thing?". If the lifestyle were to be embraced rather than prohibited, vandwellers could provide some relief for Moab's growing pains.